Product prices and availability are accurate as of 2019-03-21 08:41:54 EDT and are subject to change. Any price and availability information displayed on http://www.amazon.com/ at the time of purchase will apply to the purchase of this product. Female thread inside, brass material,hex nut. Used widely to connect the thread pipe and hose, is easy to install. 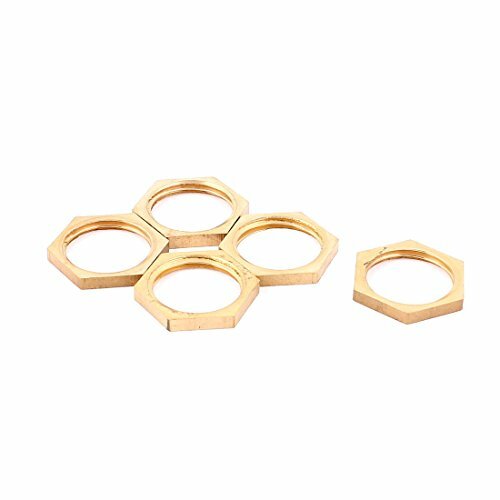 Thread Size: (Female)19mm/1/2BSP(D); Product Name: Hex Nut Pipe Material: Brass; Weight: 24g Package Content: 5pcs x Hex Nut Pipe; Main Color: Brass Tone Hex Size: 24mm/0.94"(W) Thickness: 3mm/0.12"